trends, and some chefs create the trends. Shawn Shum is one of them! Foodies familiar with the local F&B scene will know Chef Shawn from his Rowan & Parsley days. 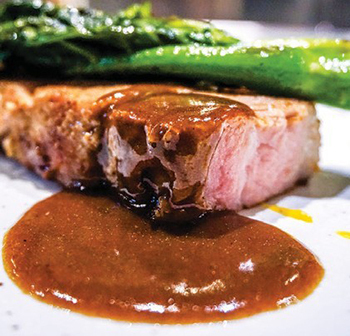 Known for constantly pushing culinary boundaries by combining numerous cooking techniques to bring out better the natural textures and flavours of each ingredient, Shawn and his team at Restaurant VOiD promises a glorious dining experience like no other. 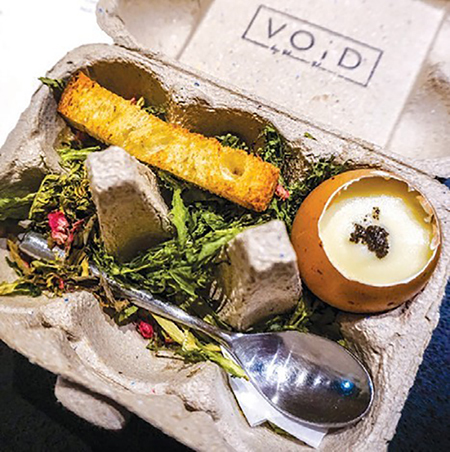 VOiD serves brunch (including vegetarian options) and dinner from 10am to 11pm, but the focus here lies primarily on seasonal produce, of which their menu comprises. From the seasonally inspired ingredients right down to the silverware and serving plates of which Shawn’s gorgeous creations are presented in, VOiD reflects a certain culinary style that’s both visually stunning and sensorial from taste to texture. VOiD’s omakase dinner consists of 11 courses, with prices ranging from RM288++ (fish) to RM398++ (wagyu beef) per pax,depending on the choice of meat for the main course. Once our whole party arrived, Chef Sunny briefly introduced our omakase menu for the evening which consists a series of plates, beginning with the lightest fare and subsequently proceeding on to the heavier dishes. Over 2 hours and 11 (+1 pre-dessert) dishes later, our gastronomy void was heartily filled by Chef Shawn (still only 26 years of age) and his youthful team with an average age of 23 years. From humble but delicate tasting starters right down to premium seafood and meat options, the execution of each course is simple yet refined, with an array of alluring flavours leaving us beyond satisfaction!